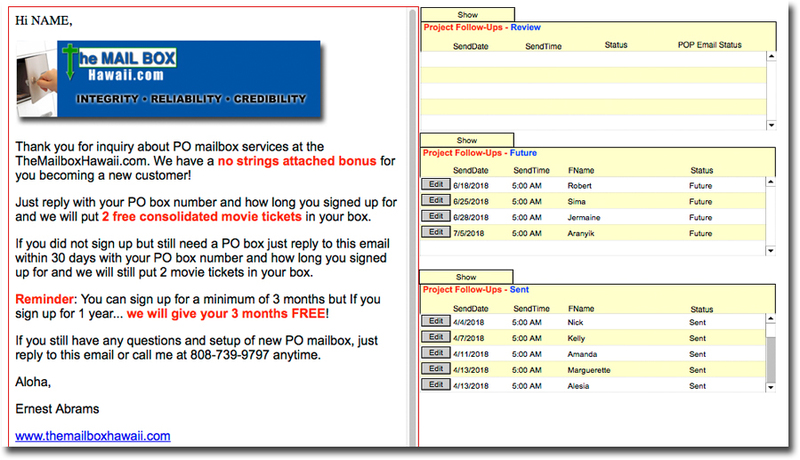 The MBC eTrigger Customer Follow-Up System automates drafting, scheduling, sendingfollow-up email engagement. Similar to how Amazon has automated sending follow up emails after online purchases/engagement. Right after you have made a sales call that requires a call to action email in the future, draft/schedule your follow up and you won't have to worry about it until you receive your confirmation email that it was sent. Schedule a series of follow-up emails after a certain type transaction. Increase testimonials, surveys, reviews, social media post on your product/service. Add a new tool to your arsenal for getting products, promotions, information to your customers. Enable you to offer something special on your website for your clients and create a new revenue source. System sends our follow up Email to all website visitors who fill out form on website but did not sign up for a new account. MBC/eTrigger is capable of being setup to work with other Webmasters. 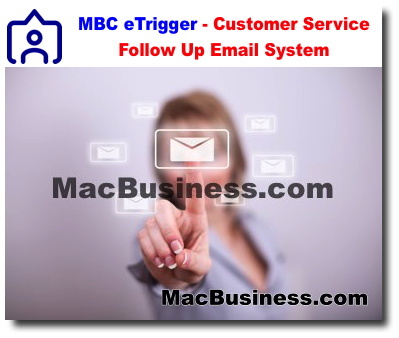 MBC eTrigger Customer Follow-Up System comes free with MBC Performance based website solution and some MBC Contact Manager Database Solutions. Custom solutions are available but limited to developer's available and scope of project. Prices vary depending on the scope of the project. Simply put, we are in the business of selling success and return on investment for our clients. Let MacBusiness Consulting help turn your web users' visits into sales.